Be the first to share your favorite memory, photo or story of Jimmy . This memorial page is dedicated for family, friends and future generations to celebrate the life of their loved one. 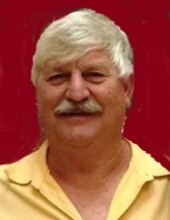 Jimmy Darrell Creech, 65, peacefully passed away on Friday, February 1, 2019 at his home surrounded by his family. Born November 11, 1953 in Johnson County he was the son of the late Thomas Rupert Creech and Doris Campbell Creech. Jimmy, along with his son, was the owner and operator of Creech & Son Roofing. He worked hard for over 40 years at his craft, teaching his son everything he knew, especially how to treat people. He was well respected and was liked by everyone that knew him. His sense of humor will always be remembered by the many employees and friends he worked with over the years. He will be greatly missed by so many. The family will receive friends on Monday, February 4, 2019 from 6:00 – 7:00 p.m. at Seymour Funeral Home followed by a service to celebrate his life at 7:00 p.m. in the chapel with Rev. Ferrell Hardison officiating. Burial with be Tuesday at 10:00 a.m. in Evergreen Memorial Cemetery. Jimmy is survived by his wife and the love of his life of 45 years, Susan Hales Creech; two children he was extremely proud of, a daughter, Virginia Taricani and husband Bud; a son, Jason Creech; the apple of his eye and his only granddaughter, Charlotte Taricani. Jimmy will forever leave a huge void in the lives and hearts of his family. Jimmy is also survived by sisters, Rose C. Howell of Goldsboro, Susan C. Bartnick and husband Heinz of Chesapeake, VA; a brother Tim Creech of Swansboro; and several nieces and nephews. In addition to his parents, he was preceded in death by his brothers, Don Creech and Ronnie Creech; and a sister-in-law, Terri Creech. To send flowers or a remembrance gift to the family of Jimmy Darrell Creech, please visit our Tribute Store. "Email Address" would like to share the life celebration of Jimmy Darrell Creech. Click on the "link" to go to share a favorite memory or leave a condolence message for the family.